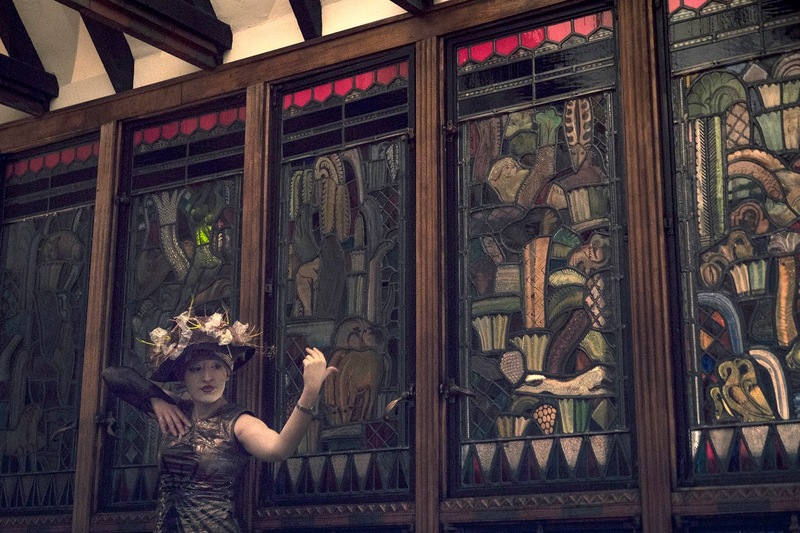 Pivot Arts presents Charged Spaces/Changing Bodies, a series of site-specific performances in two historic Uptown spaces in conjunction with Chicago Architecture Foundation’s Open House Chicago weekend. Performances are scheduled for Thursday, Oct. 11, Friday, Oct. 12 and Saturday, Oct. 13 at 7:30 p.m. and Sunday, Oct. 14 at 4 p.m. The performance begins at the Institute for Cultural Affairs, 4750 N. Sheridan Rd., with Notes on Territory written, choreographed and performed by Anna Martine Whitehead. Audiences are then led across the street to Lawrence House, 1020 W. Lawrence Ave., for Les Chanteuses du Rien, created and performed by Sara Zalek, Elaine Lemieux and Hanna Brock. This piece will take place within the Lawrence House lobby and culminate in its swimming pool. The multi-disciplinary event concludes with Five Stud Stud by Carole McCurdy in the Lawrence House’s gym space. Audiences will be led by a guide through the spaces to witness the performances happening throughout each building. A suggested donation of $20 will be requested at the door. For reservations or additional information, please visit pivotarts.org/events. Institute for Cultural Affairs, 4750 N. Sheridan Rd. Part performance and part installation, Notes On Territory uses movement, sound, video and text to address "containment architectures" such as prisons, cathedrals, dungeons and homes. The piece considers known architectural shapes and spiritual traditions such as crosses and arches in relation to the hole – a space which is only known by the wall that surrounds it – as a means of exploring the rich tradition of Black liberation practice. Notes on Territory has had work-in-progress showings at ACRE and Ragdale (2017), Elevate Chicago Dance (2017,) Velocity Dance Center (2018), Whitman College Spring Studio Series (2018) and Pivot Arts Festival (2018). Generous support for Notes on Territory has been provided by Chicago Dancemakers Forum; Headlands Center for the Arts; Daring Dances at the University of Michigan, Ann Arbor; and the Pivot Arts Incubator program. Lawrence House, 1020 W. Lawrence Ave.
Les Chanteuses du Rien employs genres of classical scores, experimental opera, improvised sound, expanded cinema and Butoh dance to explore the lobby and swimming pool space at Lawrence House. 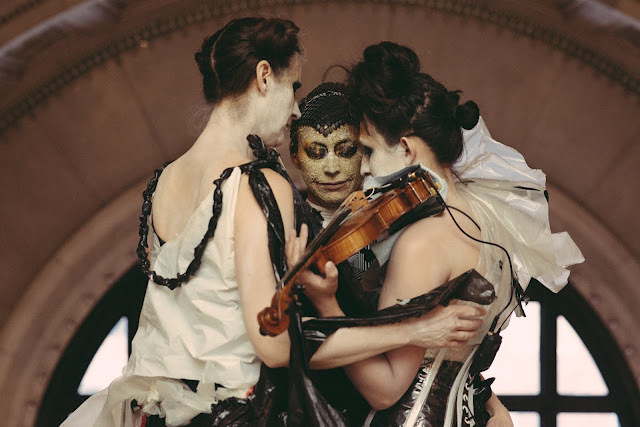 The performers are a trio of tricksters who desire to communicate intimately with an audience while revealing hidden histories. Five Stud Stud explores spectrums between violence and tenderness. The performance is both intense and absurd, taking place in an installation of inflatable punching bags. Versions of this piece have been performed at Ragdale Foundation, Dogleach/Hume, Comfort Station, OuterSpace and Defibrillator. Anna Martine Whitehead is a transdisciplinary artist interested in the body as material, signal, archive. She’s been presented by Velocity Dance Center; Watts Towers Art Center; Yerba Buena Center for the Arts and the Hemispheric Institute for Performance and Politics. Her work Notes On Territory was developed and then presented as a work-in-progress as part of the Pivot Arts Incubator program. She has contributed to projects by Onye Ozuzu, Jefferson Pinder, taisha paggett, Every house has a door, Keith Hennessy, BodyCartography Project, Julien Prévieux and the Prison + Neighborhood Art Project. Whitehouse has been published in Art21, C Magazine, Art Practical, frieze; contributed to Meanings and Makings of Queer Dance; and is the author of TREASURE | My Black Rupture. She is a 2018 Chicago Dancemakers Forum Lab Artist. Carole McCurdy is a Chicago-based artist whose performance work addresses grief and anxiety, duty and resistance and the absurd mysteries of embodiment. She received a 2016 Lab Artist award from the Chicago Dancemakers Forum and was a fall 2016 Sponsored Artist at High Concept Laboratories. She created and directed an ensemble piece, Waver, with support from CDF, HCL and 3Arts Chicago. Her practices include butoh and Argentine tango and she has performed at spaces including the Chicago Cultural Center, Epiphany Dance, Links Hall, Hamlin Park, High Concept Laboratories, Defibrillator Gallery and Movement Research (NY). Sara Zalek, Elaine Lemieux and Hanna Brock are a collaborative team who have been creating together for two years in Chicago, including Chicago Cultural Center, Edgar Miller Legacy Studio, Silent Funny, Ragdale Foundation and the Hungry Brain. They have been supported by Chicago Dancemakers Forum, the Elizabeth F. Cheney Foundation, the City of Chicago, New England Foundation for the Arts and the Ragdale Foundation. Julieanne Ehre is the founder and the director of Pivot Arts. She both leads the organization and curates performances including the Pivot Arts Festival, Live Talk series and oversees the “Celebrate Community!” parade. She was the NEA/TCG New Generations “Future Leaders” Fellow at the Goodman Theatre where she served as producer on Latino Festival, New Stages Series and conceived of and produced the Goodman’s Artists Talk series. Ehre served as a delegate to the Santiago a Mil Festival in Chile and the ITI World Theater Congress in Xiamen, China through Theater Communications Group and was the co-chair of the Arts and Culture Committee for Chicago’s 48th Ward. As the artistic director of Greasy Joan & Co. for five years, she directed and produced critically acclaimed and premiere adaptations of classic plays and worked as a freelance theater director. Ehre holds an MFA in Directing from Northwestern University and a BA in Anthropology from Grinnell College. Peter Taub is a curator and arts manager with over 30 years of experience in developing and producing artist-centered projects. Based in Chicago, his current curatorial projects include curating Elevate Chicago Dance (October 2018 and October 2017), a festival with more than 40 choreographers and site-specific performances with Matty Davis/Ben Gould (June 2018) and Pivot Arts (October 2018). Last year, Taub curated a performance series during the Venice Biennial for V-A-C Foundation inspired by the centenary of the Russian Revolution. Taub was the founding director of the performing arts program at Museum of Contemporary Art Chicago from 1996 - 2016 and developed the program into a leading presenter and producer of multidisciplinary dance, theater and music. While there he established the MCA Stage New Works Initiative to support artists with creative residencies and commissions. He co-founded the Chicago Dancemakers Forum (CDF) to support artistic exploration and growth with funding and mentorship, and it is now the largest source of new dance development in the region. Pivot Arts produces and presents contemporary and multidisciplinary performance on Chicago’s far north side. They develop new work and present performances throughout the year culminating in a large-scale festival. Their vision is that of a vibrant community where collaborations between artists, businesses and organizations lead to the support and creation of unique performance events. Charged Spaces/Changing Bodies is supported in part by the Alphawood Foundation, FLATSstudio, the Illinois Arts Council, the Institute for Cultural Affairs, and the MacArthur Funds for Art and Culture at the Richard H. Driehaus Foundation.